Yes. It works for items Bloodborne, but I don't have Darksouls 3 so I'm not sure if it's the same. Changing the values of items? I can confirm that value editing in DS3 works. I'm asking if Item Swapping works, through both games. And where would you find the ID's for Bloodborne Items, seeing as there's no PC compilation. If I change both of those ID's, it will swap the item. If it works on Bloodborne, then great. Where do I find IDs for Bloodborne Items? I only know a few. Can i get clarification on the bullets? 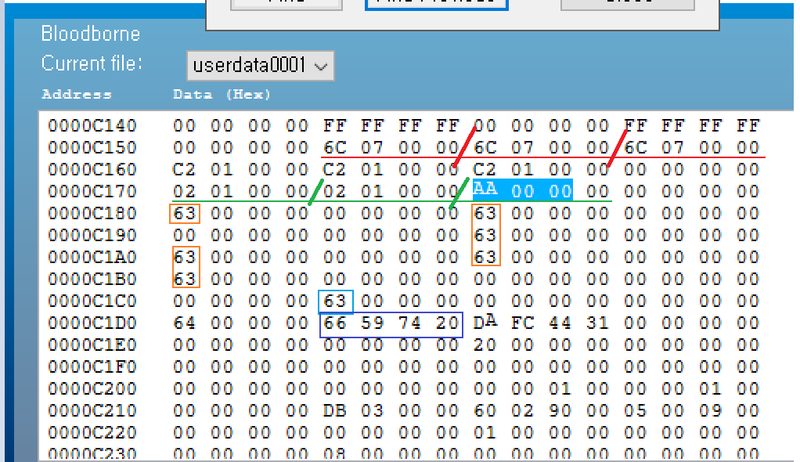 Is 8403 hex/Dec and it in little eindian? Apparently if you change the first 84 03 to 00 00 it gives you infinite bullets. If that's true, I assume the 00 B0 is what is used/depleted when you use the 00 40 item in your inventory. I am just guessing though. I've never tried this. I usually just make do with blood bullets and rarely run out in most areas. I’ve been trying to do this for days and I still don’t understand. I want to edit my blood echoes and I can’t find them or successfully edit them and yes I found my name. I only have 88 blood echoes. Any help would be greatly appreciated. xMcneilx wrote: I’ve been trying to do this for days and I still don’t understand. I want to edit my blood echoes and I can’t find them or successfully edit them and yes I found my name. I only have 88 blood echoes. Any help would be greatly appreciated. 88 decimal is 58 in hex, so you should be searching for that. Play more so that you get a larger number that's less likely to appear elsewhere in the save. Also, why not just use the SW "Max Blood Echos" Quick Mode cheat? This. The easiest way to do it your first time is to simply use the quick code, go in game, kill some stuff so it goes higher, go into advanced mode and find it then. You won't find many values at like 1,000,0540 or so. I got 795 in HP, i found my characters name in Advance mode. In Hex 795 is 0x31B, i don't know exactly how to look for it. I only want to change my stats to max, do i have to change the level first?, if my level is 53 and i got 20 strength---how do i look for that in the search---and what to put in to max the stats?